Wood has been a popular choice for furniture for thousands of years. While styles have come and go, wood furniture itself is a timeless fashion. Sometimes, however, you may start to notice a mildew or musty smell coming from your wood furniture. In this case, it's time to do something about it because the mildew smell is coming from mold spores in the wood, which can spread and be hazardous to your health. While removing the mold, you may have to refinish or repaint your furniture when you're done. Be safe while cleaning your wood furniture. Take your wood furniture outside and wear rubber gloves, safety glasses and a mask. You are dealing with mildew and harsh chemicals and should err on the side of caution. Wash your furniture with washing soda (sodium bicarbonate) and water. You can purchase washing soda from your local home improvement store and where laundry items are sold. In a gallon bucket of water, add 4 to 6 tbsp. of washing soda and mix. Scrub your furniture. Dip a scrub brush into the cleaning solution and scrub your wood furniture from the top to the bottom. Be sure to get inside and out and in all drawers and cabinets. Use a toothbrush for edges and corners. Rinse your furniture with a clean wet cloth. Be sure to remove all cleaning solution. 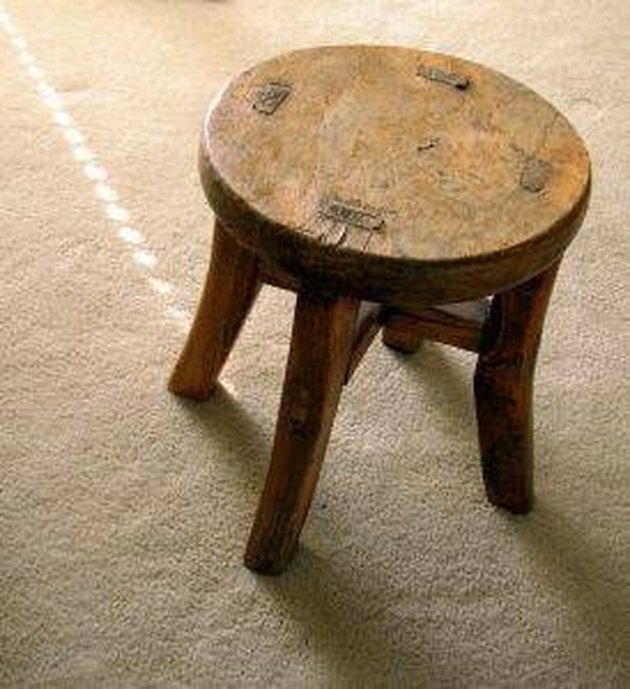 Allow the furniture to dry in the sun. Repeat, if necessary using harsher chemicals. If the mildew smell is still present, repeat the same process, except either use 2 tbsp. of ammonia and 5 tbsp. of trisodium phosphate (TSP) per 1 gallon bucket of water or 5 tbsp. of TSP and 1 cup of chlorine bleach per 1 gallon bucket of water. Choose one method. Do not use both at the same time because a dangerous chemical reaction can occur when ammonia and bleach are mixed. Repaint or refinish your furniture, if necessary. After a couple of weeks, if the mildew smell is gone, you can have your wood furniture repainted or refinished.